On Sunday 15th July our minister. Patrick. 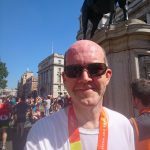 ran the British 10k on a very sunny day in London, raising over £1000 for All We Can. Congratulations to Patrick for a great run and effort! If you would still like to sponsor Patrick, you can do so here. This entry was posted in Activities on July 18, 2018 by admin. 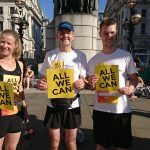 Thank you to everyone who sponsored me and the group who were running for All We Can – altogether the group raised well over £5000, before Gift Aid was added.